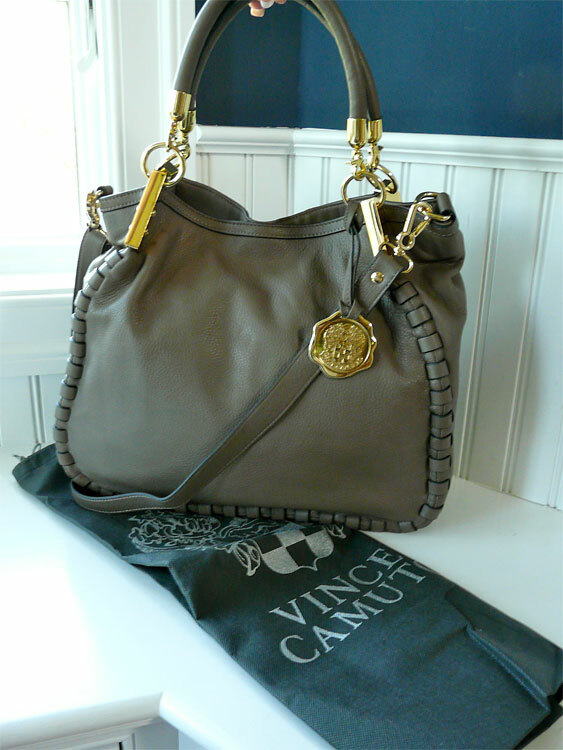 Handbags (Vince Camuto): Vince Camuto Kat Satchel Double Handle (Grey). This stunning, year-round satchel utilizes buttery leather as the perfect backdrop for softly whipstitched sides, metal plackets at the base of the handles, and a smattering of gold metals studs covering the handles for a hardware pop. Zippered pocket across back of bag, magnetic snap closure, interior has three open pockets and one zipper pocket. Detachable Strap Length: 22 � inches. Exterior zip pocket. Interior zip, wall and cell phone pockets. Logo-jacquard lining. Nappa Leather. Gold-tone Hardware. Double Handle. Color: Grey-Brown (Elephant) Mesurement: 17" W x 13" H x 4" D.